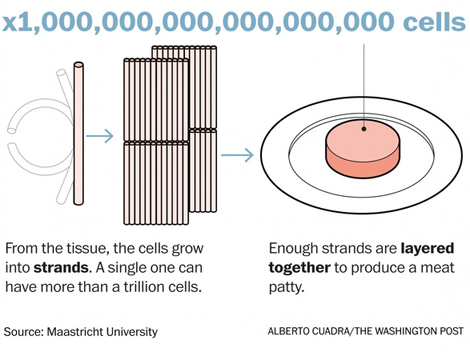 Cost of a lab-grown artificial meat burger in 2013: $325,000. Cost in 2015: $12. It’s only been two years since the world’s first test-tube-grown burger—grown from actual cow stem cells—underwhelmed both taste-testers and chefs alike. But as anyone who cooks can tell you, ongoing taste-testing is key to developing recipe perfection. The 2013 version cost around $325,000 to produce (ouch). Professor Mark Post tells thee Australian Broadcasting Company that the cost in 2015 is down to $80 per kilo—which works out to just over $11 per burger. Cause for celebration? We think so. But don’t get too excited just yet: Post was also quick to tell the ABC that it will still be around 20 to 30 years before test-tube meat is commercially viable. Post was in Australia to speak at the Northern Territory Cattlemen’s Association’s annual conference in Darwin. But Professor Post is hopeful, and believes that attitudes can change. As the short documentary film America’s Shrinking Farms reminds us, companies like Beyond Meat have been hard at work improving the vegan and vegetarian plant-based-meat game. They’ve been creating products that more closely resemble traditional animal-based meats than any previous plant-based proteins ever have. While that isn’t the same as test-tube beef that’s grown from actual cow stem cells, it’s still helping consumers stop thinking that meat only comes from animals raised on farms and ranches. What Beyond Meat CEO Ethan Brown says in America’s Shrinking Farms holds true in this case, as well: If science can create a protein has the same structure you’re used to in traditional meats, it’s still meat, regardless of the source. Whether consumers will eventually accept test-tube burgers as viable meats will most likely depend on taste—as it should. With 20 to 30 years for consumer attitudes to adjust, there’s still time. FastCoExist points out that Post’s research operation still hasn’t worked out how to produce this meat on a large scale, and also hasn’t found a way to produce it that doesn’t use fetal calf serum. Both these things will be necessary mountains to scale if test-tube beef is ever going to make it to grocery store shelves near you. 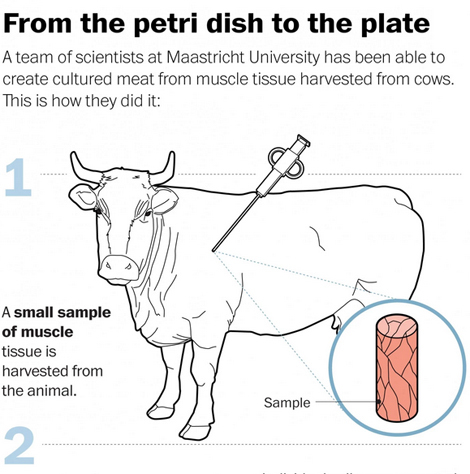 Still confused about lab-grown meat? 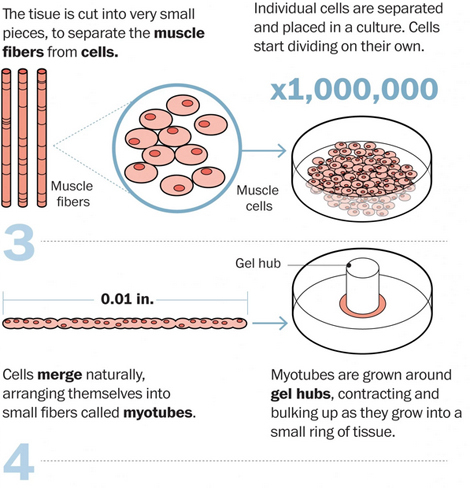 Here’s an infographic breaking down the specifics via Washington Post.